One of the difficulties studying changes in the frequency and intensity of cyclones is that the record of past storms is inhomogeneous, due to changes in observational capabilities and how storms have been measured and recorded. But a new paper by Grinsted et al. 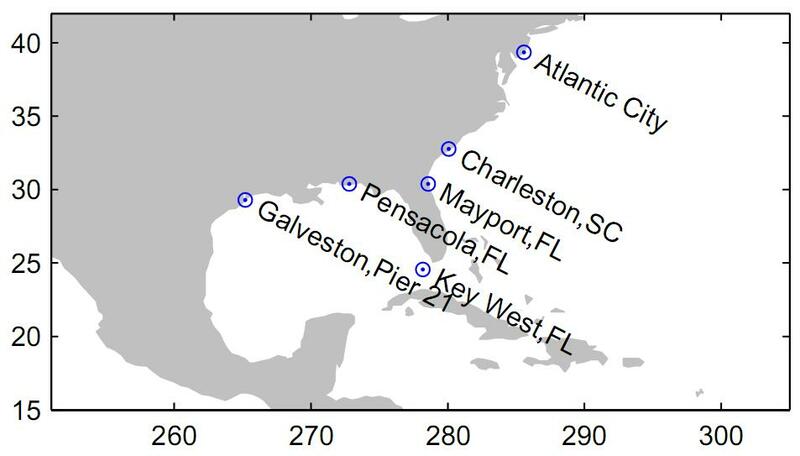 has found evidence of past cyclone occurrence in the western Atlantic which impacted the U.S. east coast, evidence which is homogenous over a period of nearly a century, by studying not storm records, but surges in sea level recorded at tide gauge stations. Cyclones bring strong winds and low pressure, so they can create a notable surge in sea level when they pass near, or over, a tide gauge station. In fact this “storm surge” is one of the most dangerous effects of hurricanes, especially if the storm strikes at high tide, because it floods the coast, one of the deadliest aspects of cyclones. Therefore not only does the tide-gauge record of surge indicate the close approach of cyclones, it gives an indication of the storm’s impact on the U.S. itself and of its destructive potential. Working with daily tide gauge data, they computed the difference from each day to the next. The square of this quantity is a measure of “surge,” for which high values can indicate the near approach of a cyclone. They also computed the total “surge index” for each year, and the number of strong surge events for each hurricane season. Then they looked for patterns over time, and differences between warm years and cool years. The graphs show surge index during the storm season (July through November) and the number of large surges per year. It also shows, for comparison, the US-ACE (Accumulated Cyclone Energy of U.S. landfalling cyclones) and the global temperature from NASA GISS. The surge index shows its largest values during the 2000s (especially the monster year 2005), but also showed large values during the very active 1930s. Also, there’s no statistically significant overall trend (which doesn’t mean there’s no trend, but if there is it hasn’t yet risen above the noise level). The number of large surge events has, however, shown a statistically significant rise since the beginning of the study period (1923). We observe that warm years are more active than cold years and that the relative difference in frequency is greatest for the most extreme events. 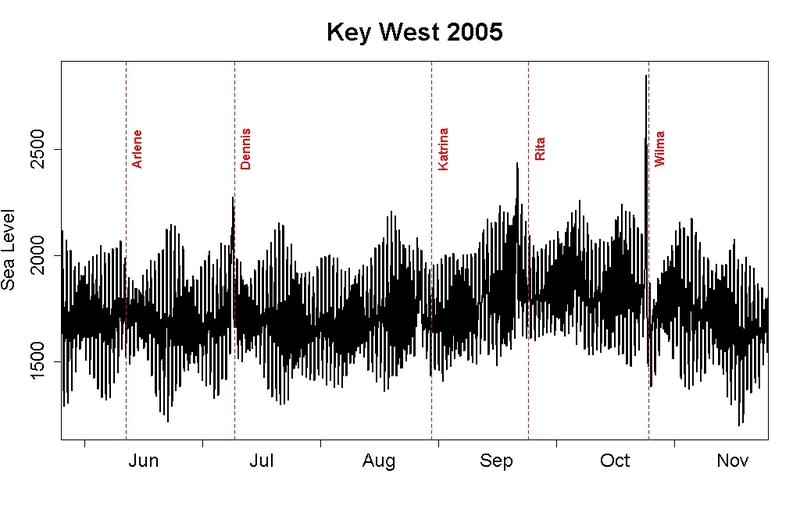 The separate GEV fits suggest that events of Katrina magnitude are approximately two times more frequent in the warm years than in cooler years (Fig. 3). This increase is significant at the 98% confidence level (Methods). Their record clearly indicates the presence of 5 named storms from that year: Arlene, Dennis, Katrina, Rita, and Wilma. I was also curious to know whether using daily data might compromise the result, because if a storm has its strongest impact at midnight for a particular tide gauge its peak effect will be spread out over more than one day and may therefore be diluted. 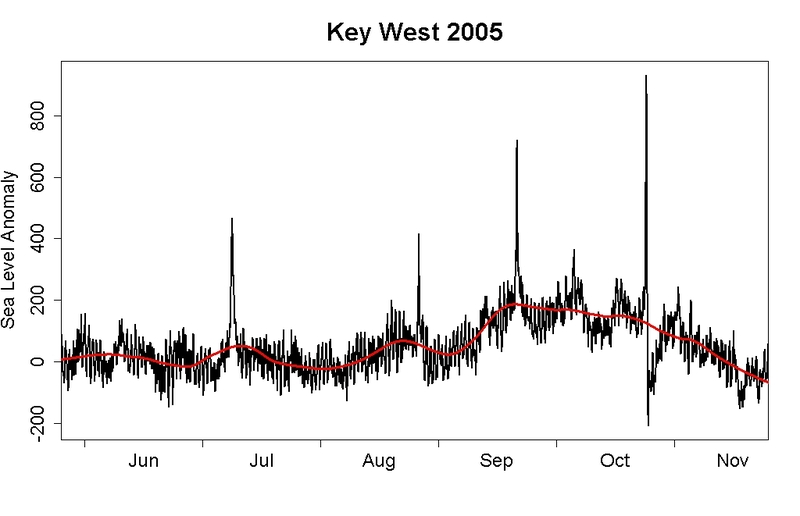 So, I downloaded hourly data for the tide gauge at Key West. Hourly data have the additional complication that they record quite strongly the tides themselves. So, for each year of data I fit a multi-frequency Fourier series, determining the frequencies which gave the best fit, to define “anomaly” values. This doesn’t eliminate the tides altogether, but does reduce them sufficiently to allow surge events to stand out from the background. Note that the tidal cycles do indeed make surges more difficult to identify. Note also that some events (e.g. 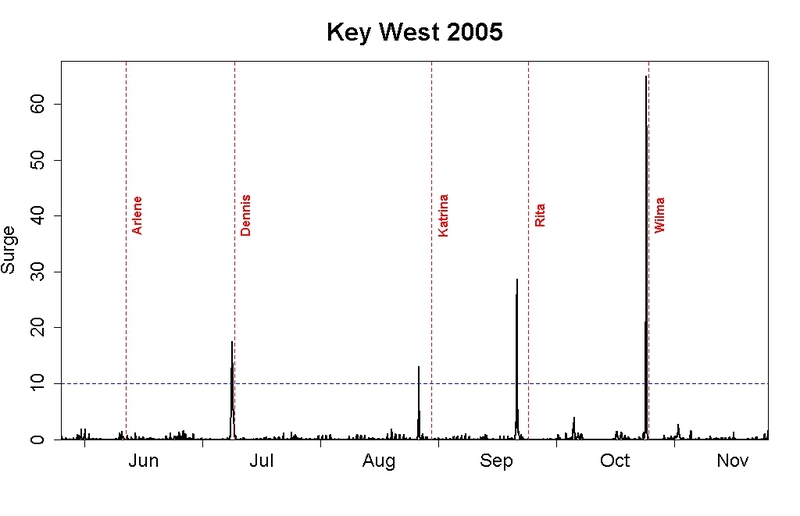 Rita) show up in the tide gauge record before their landfall date, because Rita passed by Key West several days before it made landfall in Texas. Its passage is now evident, several days before it made landfall in New Orleans. But there’s still no sign of Arlene, even though it’s listed in Grinsted et al.’s list of 50 strongest surge events. I suspect it simply doesn’t show at Key West. Arlene was only a tropical storm, it never achieved hurricane strength, but it shows clearly and strongly in the record of Grinsted et al. because it made landfall at another of the stations they included, Pensacola, FL. From this, it’s obvious that yes, the tidal surge from cyclones passing near the U.S. leaves a clear mark on the tide gauge record. In my opinion, Grinsted et al. have identified an important and reliable indicator of landfalling storms in the U.S. southeast, and have found clear (and statistically significant) evidence of increase in activity over time and association with warmer temperatures. As the world continues to warm, expect the trends to continue. The American Center of FUD better dispatch Roger Pielke Jr. ASAP. Thanks for leading us through that, Tamino. Grinsted posted a comment at Skeptical Science pointing out this publication which of course is very thought-provoking considering current events. re: “Grinsted posted a comment at Skeptical Science” — Please include direct link when referencing a comment post–otherwise they are time consuming if not impossible to find. Here is the link to Grinsted’s post at SkepticalScience. It will be amusing to watch Pielke Jnr and his fellow purveyors of FUD try and spin this. Aslak’s comment can be found here. I wonder, as a rather uneducated Devil’s advocate: would a warming world also allow hurricanes to advance further north than a more equatorial path? For instance, did a cooler planet during the middle of the century mean hurricanes just stayed further south away from the tide gauges, rather than that the number of hurricanes (or storm surges I suppose) actually decreased. Rather than filter out daily tides using Fourier, you can get a better result by filtering out the *predicted* tides for a given station as supplied by any number of available programs. In addition to the obvious tide difference caused by lunar phase, these programs (should) take account of lunar apogee and perigee, Earth’s perhelion and aphelion, and similar low-frequency cycles that are known to exist but won’t necessarily show up strongly in a short-timespan Fourier analysis. 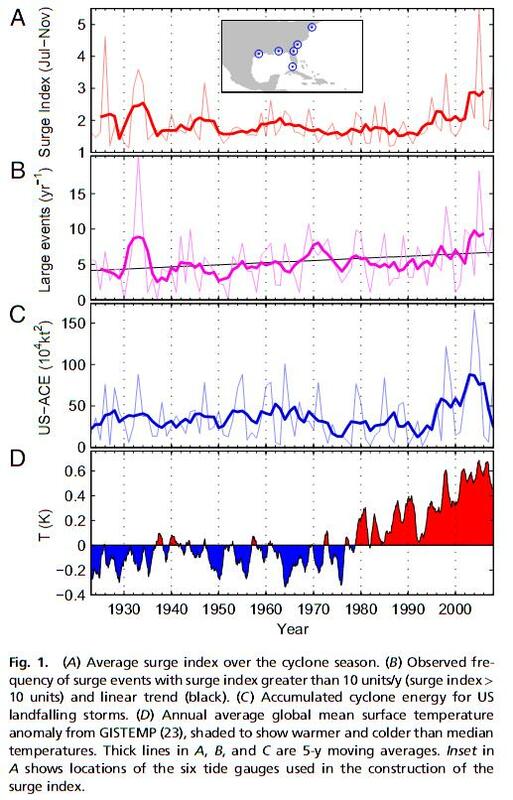 Which NOAA already provides in their time series data to begin with in the 1st place. Been there, done that, like a few decades ago even. Tamino, is it ok for Skeptical Science to republish this? For the warm/surge correlation, do you need to think about ENSO? Eg, there are two possible correlations here: an interannual correlation that is ENSO related, and a long-term correlation that is AGW correlated. (though PDO/AMO interactions with ENSO might obscure some of that, too). Could you perhaps address this by doing an ENSO correlation with a detrended surge time series, removing the ENSO component, and then looking at the remaining temperature/surge correlation? Perhaps I’m asking the same thing and don’t realise it, but I note the correlation drawn is with global temp anomalies via GISS. Is there an Atlantic subset of GISS or one of the other time series? If the implication is that warmer sea/atmospheric temperatures lead to more frequent extreme weather, should we not look at how regional temps correlate in the region where the weather systems take shape? Watching Sandy morph into Frankenstorm… I find both the event, and the name unsettling. The hurricane held together and even strengthened as it came up the east coast, due to warmer seawater in her path compared to historical norm. Couple this climate change effect with the stationary HP stuck over Baffin Bay that continues to impede and cause the downward Rossby wave in the weakened jet stream over the North American continent, pushing cold Arctic air down into the mid-latitudes. The large Rossby wave loop, and the blocked jet stream are likely caused by the loss of Arctic sea ice. The same stationary HP system and blocked jet stream causes Sandy, with lowest pressure (940 mbars) to ever get to this latitude this late in the season, to veer toward the Northwest. Frankenstorm is a great name, because man helped create this storm. Sandy is unlikely to be the last of the weird weather over the next 3-4 months… we will end up paying yet again for our ignorance and nonchalance. Thanks for that post, Tamino. Looks potentially very useful. Looking further back in time, I wonder if anyone’s looked at coastal sediments and their possible recording of sudden marine incursions? I know this has been done with ancient tsunamis in places – both phenomena would leave somewhat similar calling-cards. I wonder if it is possible to differentiate the two? > I wonder if it is possible to differentiate the two? Hank – thanks for the link. Have a good selection of reading to work through now! Yeah, it’s just a 30 (??) billion dollar “storm slosh”….. It is somewhat funny to see the commenters there raging against the media for “talking up” Sandy. Just like last summers heat wave, and the arctic ice minima. Its a very inconvenient time for fake skeptics. Facts–and data, especially in the form of real-time video–is a bit of a put-off to the denialistas, ain’t it? I would, if I could reverse Sandy and make it go away, so that all the deahs and destruction didn’t happen. In light of the aforementioned reality, and how it utterly *ticks* off the denialati, this is a supreme, for lack of a better word, schadenfreude moment. And a very teachable one, too. Yes, I’ve been over there trying to deal with the deniers….seems like Sandy is rather inconvenient for the denial industry. The poll at the end…it needs some Wattsian love. Original survey response showed ~60:40 voting yes they believed Sandy was caused by AGW. Watts links to the survey, points out that it allows multiple voting (even though he says don’t do it) and the results now show ~40:60 voting yes they believed Sandy was caused by AGW. This is not the original WUWT site but a parody blog. Yes, WUWT is “Voltaire’s prayer” all over again. But then, where is M. Arouet when you need him most? Whether that was intentional, or not, is irrelevant: Whilst reading that “it WASN’T a Hurricane, dammit!” bleat from Eschenbach, I actually got dizzy, from the…I can’t even think of word. Disconection? D-K of the highest order? Cognitive dissonance so loud it hurt?? Always refreshing here @ Tamino’s. I’ll have another, thank you. A really nice post Tamino. It looks like a great method of finding major storms in the past. It might miss a few, if they were particularly slow moving, or approached a tide gauge at such an angle that the tide only slowly rose? A regular Watts contributor gets a taste of their own medecine. A. Scott posts “Once again you provide ZERO support for your claims and position. And refuse to look at any data which does not support your undocumented claims. (where I can link the full paper, but that does not mean it is open access). Kevin McKinney — Vavrus’s website has a pdf copy of the full paper. Storm surges may raise some eyebrows until you look at a longer time period as was done in this study. It’s not a very comprehensive record though; Grinsted et al may have covered a shorter time span but the total number of events observed is much larger. It’s also more indicative of general hurricane behavior, since regardless of my own question above, looking at surge records along the southern and southeast coasts is better since you’re right in hurricane alley, so to speak. Beware drawing conclusions from the surge graphic too, before you take into account the huge time gaps between (say) the second and third data points. To say there’s a trend is spurious. My point with that link was just to show that evidence of strong storm surges from the past is a reality. We now have extermely good coverage of weather all over the world and can see all major storms and watch them, log their strength and size. At best we only have a few hundred years of data and it gets fuzzy the farther back you go. In just this last interglacial period the time frame is 10000 years. 100 years of data is only 1/100 of that time span. This is the time of relatively stable climate. Without better information of the totality of the global weather during this time (numbers of tornadoes, floods, hurricanes, droughts, high winds) it may be premature to attribute every bad storm or drought to the 0.8 C increase in global temperature. 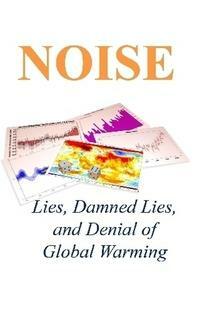 So far as I have been reading every major event that affects people is attributed to global warming. Moscow heat wave, Texas drought of 2011, high temp and drought in US in 2012, Hurricane Katrina, Hurricane Sandy, the huge blizzards in Chicago and the Northeast a few years ago. But looking some weather history. We had severe heat and drought in the decaded of the 30’s. The Mississippi has had some really large flooding events. There have been some really bad hurricanes strike the US. That is why science should slow a little and gather more information before making any claims. [Response: No single lung cancer case can definitively be attributed to cigarette smoking! We had lung cancer and emphysema victims long before smoking became widespread enough even to *consider* its impact. Perhaps you think science should slow a little and gather more information before making any claims. With Sandy, the meterologists were able to correctly predict its path and strength. The models they are using are much better and they feed real time data into them. They predicted it would turn west and devestate the East coast. Since these models seem to be very good, they should be able to tell if Sandy was the result of global warming or just a bad combination of events that are farily rare (but happen) regardless of any climate change. It turned west because of a large winter storm developing at the same time and the two systems merged. [Response: No. It turned west because of a high pressure system over Greenland, which may well have been exacerbated, or even caused, by the disappearance of Arctic sea ice, which most certainly was caused by global warming. I do know the smoking analogy. Still with smoking you would have to provide some linking mechanism with the products in the smoke with cancer formation. So, not “every bad storm,” but dice are indeed loaded. Sorry, Tamino, to drift so far off-topic; you can snip this if you like..
Not good to edit a longer post and then engage in righteous anger over a partial and not valid post. In the original I clearly stated there was a link. The chemicals in smoke do damage DNA that can lead to cancer. Hope you post this reply. The odd thing is he appears to be progressive in his political activities. Jarring juxtaposition. Norman, I am going to give you the benefit of doubt that your statement about smoking came off a whole lot more clueless than you really are. However, there are plenty of studies that show a causal link between smoking and some cancers. Most of the carcinogens are chemical. There is plenty of di-methyl-chickenwire in cigarette smoke–and those benzene rings aren’t good for you. However, I also point out that cigarette smoke is a major source of exposure to Po-210, one of the most powerful alpha emitters among the naturally occurring isotopes, and coincidentally a favorite poison for Russian spooks. Tobacco scoops this stuff out of the soil so effectively that it is recommended for environmental clean-up. An alpha emitter in lungs is a cancer generator. That would be me, for one. As my dad was in remission from his small-cell/oat-cell lung cancer, I tried giving him the science to try to get him to stop smoking. The CDC had found that 97% of people who had this type of cancer of the lungs either were active smokers or had been smokers. My dad had been smoking for about 45 years. He, of course, didn’t believe it. Indeed, he thought the smoking killed the cancer. Denial is a real condition, Norman. And global warming, of course, touches every part of the climate system. Every weather event is shaped by it — every event is slightly or significantly different from what would have been if the enhanced greenhouse effect had not occurred. It’s quite possible–likely even–that without decades of global warming, Sandy would either not have formed or would have formed in a different place and/or different time. That’s not the message I prefer to focus on, though, because the public is generally ignorant where climate science is concerned (we might say, “sad, but true,” but they can’t be blamed: it’s a very complex situation). They respond better when they think AGW is something that jumps out at them with greater and greater frequency (which, in a world of persistent instability, it does). Telling them that the 24/7 climate is radically different than what it would have been tends to diminish the effect and increase the sense of inevitability and powerlessness. On the BBC World Service’s programme World Have Your Say, Myles Allen referred to (what was probably) the Galveston hurricane of 1900. This was in response to a question about whether the frequency of hurricanes has increased due to climate change. Professor Allen’s seemed to imply that we just don’t know. The programme was discussing whether hurricane Sandy had become more likely because of climate change. I think it was David Shuckman, BBC’s Science Editor, that said this is “one for the scholars not for ordinary people”. Some of the individual statements by Alan and Shuckman may be difficult to challenge but I would like to see a transcript of the programme to examine its tenor more closely. Does anyone know whether there will be a transcript anywhere on the web? Great post Tamino, and fascinating paper. And sadly your assertion appears to be correct – we’re going to see a lot more of this. Peilke Jr. has has a crack at the Grinsted paper. I’d be interested in seeing your response to his comments. A classic Roger the dodger post. Roger is twisting away trying to make Grinsted et al claim stuff about landfalling hurricanes that they in fact have not….while ignoring the bulk of the discussion in the paper.